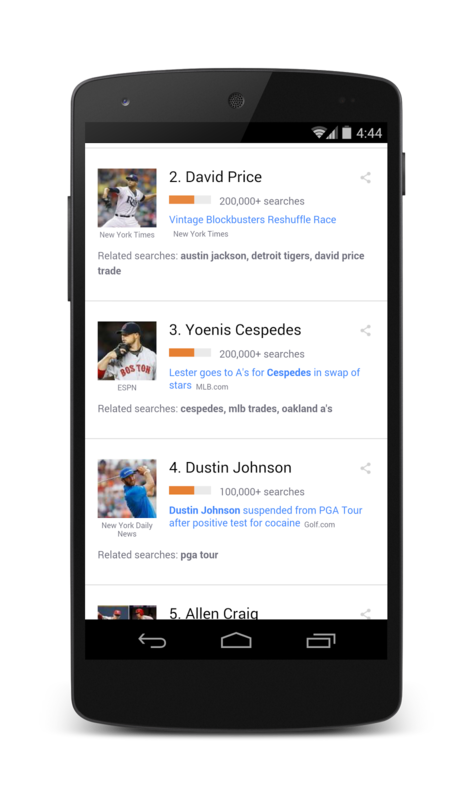 This season’s MLB trade deadline was yesterday, and as news of surprise trades emerged, people were quick to catch the latest via search. More than half of the day’s hot trends were baseball-related, and searches for the blogs [mlb trade rumors] reached their highest volume all year. From the three-way trade that landed David Price in Detroit and Austin Jackson in Seattle to the A's-Red Sox swap of Jon Lester and Yoenis Céspedes, it was quite the active Deadline Day. Thanks in large part to nerdfest Comic-Con, it was a week of sneak peeks for movie fans. First up: the reboot of Mad Max. The long-awaited remake of the Australian classic premiered its trailer at the conference last weekend, and fans got their first real glimpse of Bane Tom Hardy as Max. Meanwhile, a sneak peek of Israeli actress Gal Gadot as Wonder Woman in the forthcoming Batman v. Superman: Dawn of Justice made waves. And a new teaser trailer for Hunger Games: Mockingjay - Part 1 gave us a new glimpse at Katniss as the face of the rebellion. Though neither film will be in theaters for some time, fans are keeping busy in the meantime: searches for new releases Guardians of the Galaxy, Lucy and Hercules were all high on the charts. And those who prefer their movies with a hefty serving of camp to go with their popcorn had more than enough to satisfy them with Sharknado 2: The Second One. Searches for [sharknado 2 trailer] were up 95 percent over the past month, and the movie was one of the top topics Wednesday when it premiered on Syfy. Simply stunning. Finally, the trailer for the movie version of Stephen Sondheim’s Into the Woods had musical theater lovers ready for more. An ebola outbreak in West Africa has people concerned about the spread of the deadly epidemic. Searches for [ebola] are at their highest ever, up 2,000%, and related searches like [ebola in nigeria], [ebola symptoms] and [what is ebola] grew too. Worldwide, Liberia had the highest search volume of any country. Next time you’re invited to a summer barbecue, let Google help you remember to pick up a snack or six-pack to contribute to the fiesta. 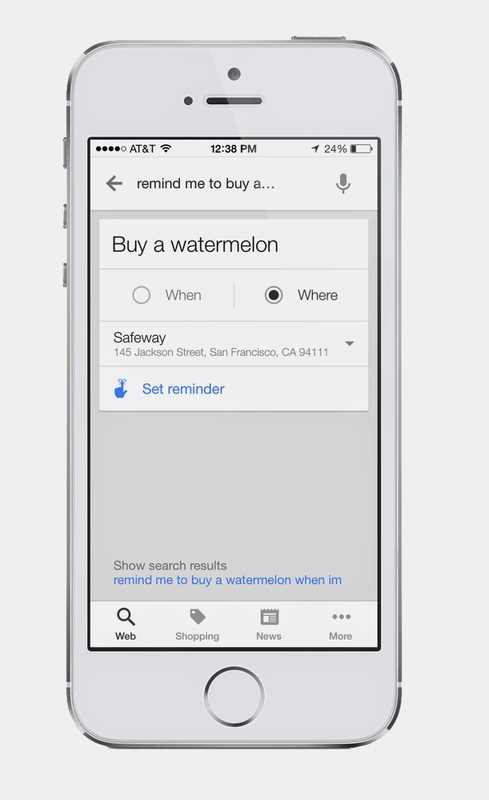 On your Android or iPhone, just say “Ok Google, remind me to buy a watermelon when I’m at Safeway.” Next time you’re near the store, you’ll get a prompt. No more showing up with empty hands! 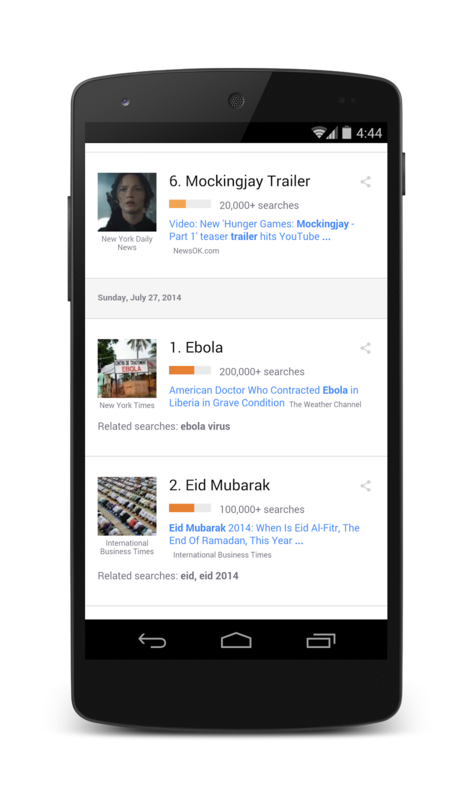 This entry was posted on Friday, August 1, 2014 at 3:49 PM and is filed under search trends. You can follow any responses to this entry through the RSS 2.0. You can leave a response.